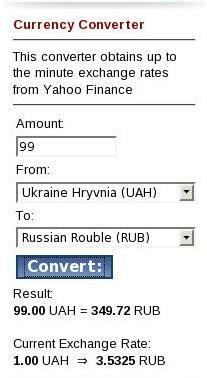 Module to allow your users to determine currency conversions from one denomination to another. The module uses AJAX functionality so the page doesn't have to refresh when fetching the rates or making the calculations. It uses Yahoo Finance to obtain the up-to-the minute conversion rates and presently there are 153 denominations to choose from! There are MANY configurable options! Нужное и полезное расширение для вашего сайта, позволяющее вычислять стоимость любых сумм - в любой валюте мира; сделано на AJAX, таким образом - нет необходимости перезагружать страничку сайта, и использует Yahoo Finance.